A rule compelling the critic of official conduct to guarantee the truth of all his factual assertions—and to do so on pain of libel judgments virtually unlimited in amount—leads to a comparable “self-censorship.” Allowance of the defense of truth, with the burden of proving it on the defendant, does not mean that only false speech will be deterred. Even courts accepting this defense as an adequate safeguard have recognized the difficulties of adducing legal proofs that the alleged libel was true in all its factual particulars. Under such a rule, would-be critics of official conduct may be deterred from voicing their criticism, even though it is believed to be true and even though it is, in fact, true, because of doubt whether it can be proved in court or fear of the expense of having to do so. They tend to make only statements which “steer far wider of the unlawful zone.” The rule thus dampens the vigor and limits the variety of public debate. It is inconsistent with the First and Fourteenth Amendments. The constitutional guarantees require, we think, a federal rule that prohibits a public official from recovering damages for a defamatory falsehood relating to his official conduct unless he proves that the statement was made with “actual malice”—that is, with knowledge that it was false or with reckless disregard of whether it was false or not. 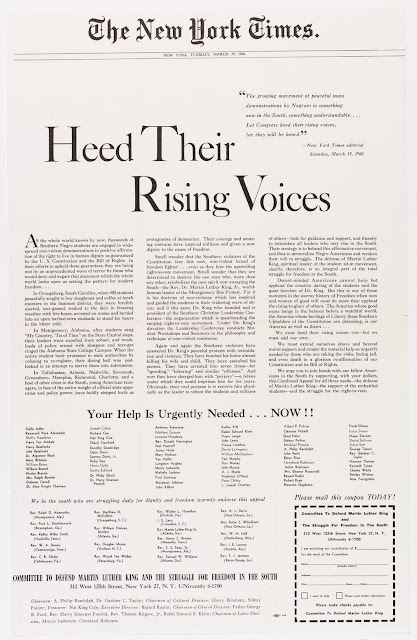 On Tuesday 29 March 1960, an advertisement (above) appeared in The New York Times describing non-violent civil rights protests in the South—Freedom Rides, lunch counter sit-ins, protests at state capitols and on college campuses. 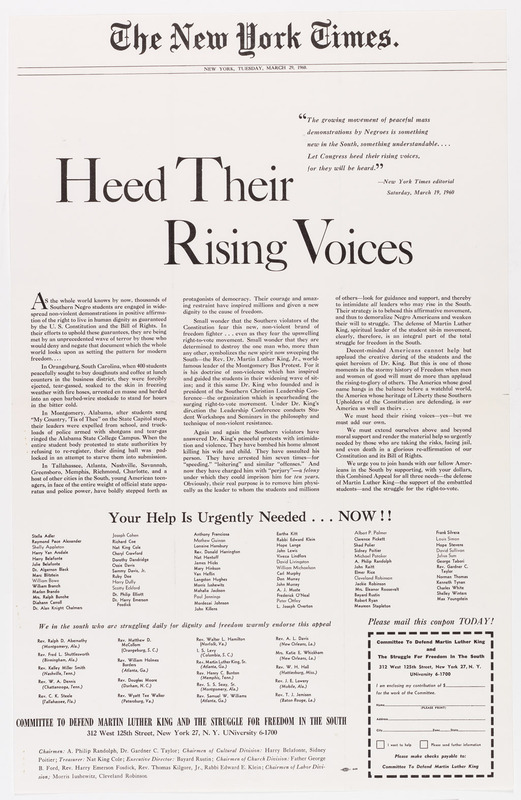 The advertisement described some of what the protestors met, including threats to bomb Rev Dr Martin Luther King’s home and actions of public institutions, such as the treatment of student protestors and the repeated arrest of Dr King by the police. L.B. Sullivan, an elected Commissioner of Montgomery, Alabama, claimed that while the advertisement did not mention him by name, its references to “the police,” in some instances factually inaccurate, libeled Mr Sullivan personally. He sued The New York Times and four religious involved in publication of the advertisement. A Montgomery County jury awarded Mr Sullivan $500,000, which the Alabama Supreme Court upheld. In a landmark decision written by Justice William J. Brennan, Jr., the Supreme Court reversed the Alabama Supreme Court and established that “actual malice”—publication “with knowledge that it was false or with reckless disregard of whether it was false or not”—must be established in order to find libel and award damages for statements made about the official conduct of a public official. I think certain kinds of speech, the raucous, uninhibited American habits of razzing our politicians and our public figures—you know, the right to have fun with Jerry Falwell, which the Supreme Court said was protected by the First Amendment; hate speech, ‘freedom for the thought that we hate,’ Justice [Oliver Wendell] Holmes said—is more deeply rooted in our culture and our law than any other country I know of. Is The Free Press Better Off 50 Years After The Sullivan Decision? In a 14 March 2014 National Constitution Center podcast hosted by Jeffrey Rosen, CEO and President of NCC, Richard Epstein from the New York University School of Law and Geoffrey Stone from the University of Chicago Law School discuss if the free press is in a better place now, or if New York Times v. Sullivan needs to be revisited. Labels: Anthony Lewis First Amendment Free Speech Geoffrey Stone Jeffrey Rosen New York Times New York Times v. Sullivan Richard Epstein William J. Brennan Jr.